Most film and TV people have to fake it a little, and make a handful of costumes represent dozens of characters. 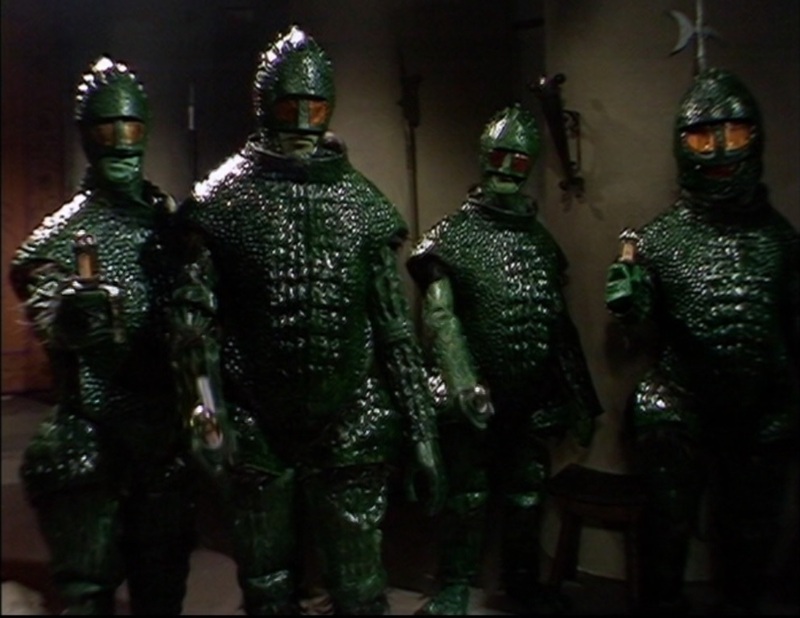 The problem here is that the BBC had three and a half Ice Warrior costumes. You see that fellow on the right? He’s the Bubblehead Warrior. That head had been sitting in storage since the Ice Warriors’ first appearance seven years previously. Now, you can’t tell the other three actors’ costumes apart, so any of those guys will do for any closeups, but the director keeps bringing the Bubblehead in for closeups in these last three parts. I don’t understand why Lennie Mayne did this. Don’t draw attention to the one that is a) the most distinctive and b) the most obviously crap. That seems like a simple enough plan! Last I checked, I was in the top five for having the most letters printed in 2000 AD, but I don’t have any art credits on the input page. I’m sure the Tharg of the time – probably Steve MacManus? – turned it down because it was a reference to a very obscure character who had been on TV for three weeks some twelve years previously and never repeated in Britain, and not because my art completely stinks. That’s the reason, right, Green Bonce? This episode ends with the umpteenth swordfight we’ve watched recently. This time, Ralph Watson matches blades with Jon Pertwee, and, painfully obviously, Pertwee’s double Terry Walsh. It’s a good fight, but I felt the need to assure our son that in the real world, people just don’t get into swordfights anywhere near as often as they do on television. My wife added that she took fencing in college and so she’s had a few matches herself. I don’t think that’s quite the same, but maybe we should buy a nice blade for a wall decoration, just in case she needs to take it down and defend our home against fanatic miners, Hellfire Clubbers, or renegade Time Lords.